Block Diagram of the payload. 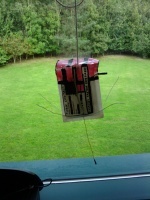 CRAAG1 is a pico High Altitude Balloon payload designed to be launched with a 36" foil 'party' balloon. 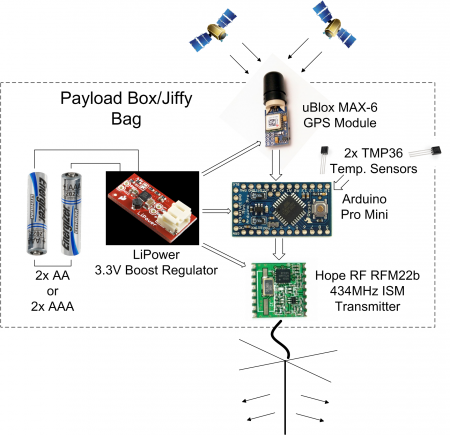 The payload consists of a simple GPS tracker with a couple of temperature sensors, powered by a single AAA battery. Launch Attempt 1 (28th September 2012) - lost grip of the balloon without the payload. Successful Launch 1 (10th October 2012) - Success! Burst at 4688m, payload recovered easily. Successful Launch 2 (26th November 2012) - Launched with 720p 808 camera, burst at 3190m, landed in a tree. On 19th September I announced the flight on the UKHAS mailing list, along with a link to the below image. I received a fair few critical comments, all constructive, and I have summarised them below. String is too strong - Fixed. Now using 0.5mm nylon cord. For balloons larger than 2m diameter, the ANO specifies a maximum of 230N breaking strength for the cord. Although this does not apply to my flight, I have no reason for the stronger cord, so will be replacing it with a more suitable type before the flight, shedding a couple of grams of weight as well as improving the safety of a possible aircraft collision. This is normal for pico payloads, but special attention should be paid to padding and security of the payload should it detach from the balloon. Sharp ends on the wires - Fixed. Wires bent back at the ends and tape re-applied. All the wire is very bendy and with tape already on the ends it does not pose a risk in my opinion. However I will be taking the advice and will bend the ends back so there's zero chance of them scratching something that they might land on (like a car!). The UK Air Navigation Order grants exemption from any requirement of the Order to small balloons, defined as being under 2m diameter at all points of flight. Therefore all the above are not against the law for my class of flight, but are good guidelines to follow. The construction is based on Dave Akerman's Guide for a pico tracker. I have chosen to make a few modifications, locating the GPS unit further from the CPU and Transmitter and adding in a couple of analog temperature sensors. The program is heavily based on James Coxon's Pico Atlas Code with extracts from the examples and documentation on the UKHAS Wiki. There is a lot of power-saving to enable a lightweight battery to be used. Any improvements that I thought of and could not be applied to this flight are planned for CRAAG2, a planned single PCB design. The code can be found on my github at: github.com/thecraag/CRAAG1/. B - Booting, GPS not yet switched on. Followed by Pips until GPS lock is acquired. F - Flight, normal operation. L - Lost GPS lock. Last co-ordinates/time will continue to be sent. N - Night mode, single telemetry string transmitted 3 times at 15 minute intervals. Absolute voltage sampled using Internal ADC with a 3:1 Voltage Divider. Located alongside RFM22b inside the Jiffy bag. Pokes ~1 inch out of the 'right' of the jiffy bag. Degrees Celsius, +- 1 degree accuracy. 0.5 degree resolution. August 2012 - An early prototype. A close-up of the main board 'cluster' of the Flight Prototype. Equipment for launch ready to go! I made sure to do plenty of testing of the payload, as this is my first attempt and I do not want it cutting out 2 minutes into the flight. 3 hours 8 minutes until TX dead. GPS set to Power-Save mode in daytime loop. 30 minutes in Max Performance mode to get a fix. - Will have drained about 15% of the battery I believe. 5.5 hours TX until 1000 string Night-mode timout. 1 hour to TX dead. Occasional heartbeat tones heard afterwards. AVR hard-froze at the beginning of the first RTTY string. Due to long power supply wires? Fixed when Lipower + batteries were connected. Found to be due to Transmitter interfering with ADC. Transmitter is now switched off during ADC conversion. Habitat parser does not like whitespace, must be stripped. This page was last modified on 3 May 2013, at 06:55.